There's nothing like spending the holidays on a Caribbean cruise, sailing in the sunshine and celebrating a Christmas that you'll remember forever. 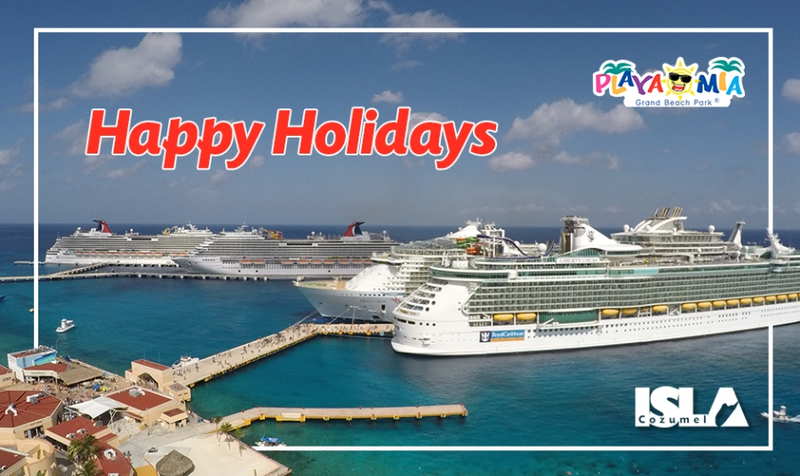 Are you embarking on a cruise to Cozumel this holiday season? Check out these savvy travel tips to make your trip even better. Plan to arrive at your port of call one day early, especially if you're flying. Holiday traffic can cause flight delays, and you don't want to miss a moment of your cruise! Bring your gifts and decor! Cruise ships don't have a limit on how much luggage you bring on board, so feel free to bring presents with you to share. Book as early as possible. While you can sometimes find last-minute deals, the Christmas break is a very popular time to travel to the Caribbean and ships fill up fast. Discuss your itinerary with everyone in the family. Keeping your kids involved in the planning process will help them feel excited instead of anxious about the trip. Plan a play day at Playa Mia! With twenty included attractions, add-on tours, and a spectacular beach - Playa Mia is an excellent choice for a holiday escape. From water slides and water trampolines to swim-up bars and our giant massage tub, everyone in the family will have a blast at Playa Mia. Celebrate the holidays with us on the beach this year. Book your visit to Playa Mia today!